A black and white large format negative of Mr. and Mrs. Duncan on their wedding day, May 17, 1947. In this view the bride and groom are standing facing the photographer. Mrs. Duncan has flowers in her hand. 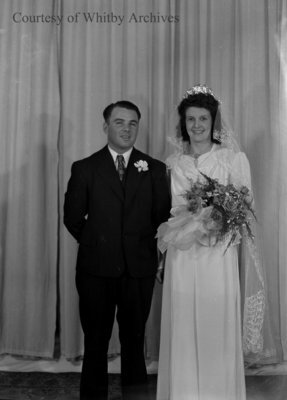 Duncan Wedding, May 17, 1947, Marjorie Ruddy. Whitby Archives A2013_040_551.